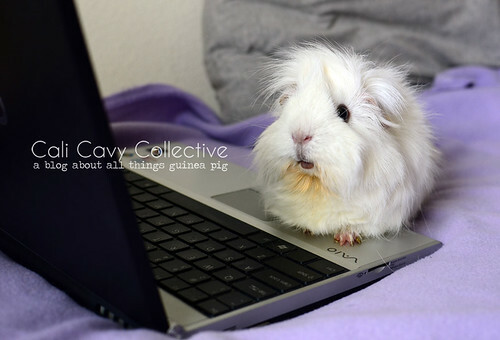 Abby-Roo shares her favorite guinea pig (and some non-guinea pig) related links from the past month, including a mini gift guide for the holidays. Here's a list of guinea pig calendars for 2014. Which ones do you fancy? Speaking of the holidays, these crochet guinea pigs would make great stocking stuffers. I can't decide which of these mugs is the cutest: 1, 2, 3, or 4. And to wrap it up, piggy holiday cards and wrapping paper. The Popcorn Prints ornament bedecked broccoli Christmas tree is too funny. Watch this wheeker go! And here I thought Belka was a fast sprinter. Guinea Lynx's Emergency Medical Guide lists signs of illness in guinea pigs along with possible causes. A must-read for every cavy owner. My latest obsession: a recipe for roasted Brussels sprout chips. The pigs have been benefiting by snacking on the leaves here and there. I was enchanted by conservationist Ian McAllister's photographs of wildlife in the Great Bear Rainforest. His images give the viewer a tantalizing glimpse into one of Canada's most remote frontiers. As a side note, I've been making felt guinea pig Christmas ornaments. Anyone interested in a craft tutorial?